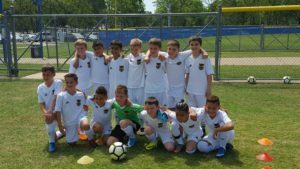 Editor’s note: PSP Fans’ View writer Scott Ellis joined his son in Dallas this past week at one of the nation’s premier youth soccer tourneys, and he’s been writing about it for PSP. Click to read part 1 and part 2. What an incredible experience! 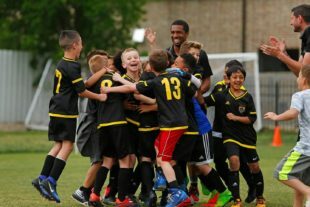 I had some surprised co-workers, family, and friends when I explained how spring break would consist of 25 8- and 9-yearold kids traveling to Dallas to play in an international soccer tournament. Some may still think it’s a bit crazy, and I understand that position entirely. But after being there with Justin, all of the other players, and their families, I’ve come to the realization that it was all the more memorable and special because they’re 8- and 9-year-old kids. Many of these have big dreams to play college soccer and eventually pro soccer. This week at the IberCup only fed that fire. They posed for photos with Atletico Madrid academy players. Our teams played the toughest competition they’ve seen to date and are stronger for it. These boys had the opportunity to play against a team from Mexico and a team from Columbia. In addition, these 2008 Dortmund teams — i.e. our teams — compete as hard as anyone but decompress quickly (moreso than their moms and dads do after these games!). My son’s favorite part of the trip, upon direct questioning, was free time at the hotel, where impromptu games of dance floor soccer broke out, games of tag were played, we watched the Union game, or just hung out around the pool. I imagine many players felt the same way. I wouldn’t change a thing, and am thrilled we chose to participate in something Justin will remember for years to come. CFC Dortmund White, after winning against Rayados (Mexico), faced one of the host teams from the Dallas Texans club. In what would generously be called an oddly officiated, very physical game on a field dropped into the outfield of a baseball stadium, the team fell just short with a 3-2 loss. Day three saw Dortmund White take on the Dallas Kicks and hang on for a 2-1 victory in another physical match on the continuously deteriorating centerfield pitch. Squarely in second place in Group A, the stage was set with a showdown against the first place PSG team, another local Texas club. Squaring off on Saturday morning, on what was thankfully a hazy and breezy Texas morning; a very well-played first half was broken up just before half-time with a bending PSG free kick that found the back of the net. Unfortunately, that lead was extended further with a couple more rocket free kicks from PSG, and Dortmund White ended up on the wrong side of a 6-1 final. Tied for playoff round qualification, Dortmund White came up one goal short on goal differential and ended play there. Congratulations on a great tournament run to: Justin, Ethan, Luis, Graham C, Massimo, Andrei, Cristian, Gavin, Graham R, Will, Nate, Cavan, Jason, and Alexis! 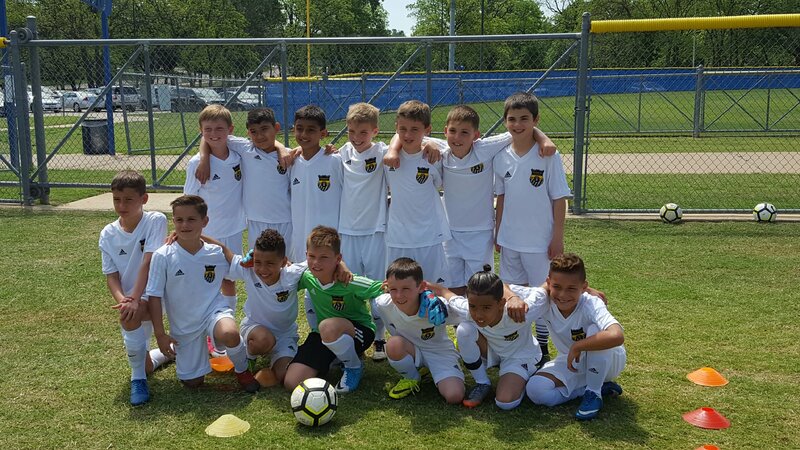 CFC Dortmund Black took on a well-coached and up for the challenge Dallas Texans club on Thursday, and earned a hard fought 4-3 victory. Friday’s matchup against PST Attack presented a stiff challenge in the first half, but a strong second half surge saw Dortmund Black pull away and earn a 6-2 result. Saturday brought Allegiance FC, and another 6-2 victory to finish convincingly on top of Pool B and earn a berth in the top 4 team’s weekend playoff. Saturday’s playoff against Solar (another strong Texas team) was played on the centerfield pitch, which at this point was dry, worn, and had tumbleweeds blowing across midfield. The result was a very bouncy ball and a heavy reliance on direct play and athleticism in this matchup. In a late flurry, Dortmund Black rallied to a 4-2 win and a date in Sunday’s final against PSG (the team who ultimately knocked Dortmund White out two days earlier). 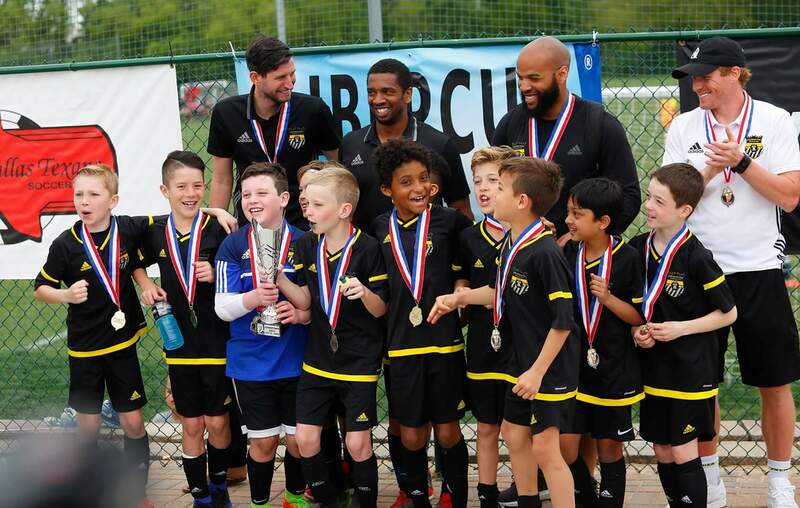 Championship Sunday was back on the immaculately kept fields at the Stewart Ross complex (home of the Dallas Texans), and with PSG being local and two teams’ worth of Continental fans, there was a fantastic crowd on hand. PSG’s tall and gifted left wing opened up the scoring early on with a great run down the left hand side and an inch perfect finish off the inside of the far post. Two strong runs from Dortmund Black forward Anisse led to an outstanding finish and a penalty kick awarded (converted by Anisse to put Dortmund Black up 2-1 in the second half). The pace of play heated up as PSG pushed to equalize, and equalize they did on a near post header from a corner kick with about one minute to play in regulation. With no overtime periods in this tournament, it was off to penalty kicks. A diving save from Dortmund Black keeper, Dylan, and two shots off target put Dortmund Black up 2-1, setting the stage for Gunnar’s calm finish into the top left corner and a raucous celebration. 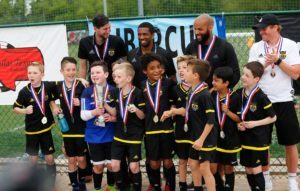 CFC Dortmund Black brought home the IberCup trophy for the 2008 division and in doing so, a spot in the IberCup tournament this summer in Portugal. Congratulations on a well-earned victory to: Max, Colin, Connor, Vincent, Gunnar, Anisse, James, Nehan, Matheus, Dylan, and Pedro. Side Trips: While the hotel and fields were a bit removed from downtown Dallas, in Farmers Branch, we did slip downtown on a few occasions. Pecan Lodge (amazing BBQ, strong draft beer list, and very cool patio area) was definitely a favorite and memorable post-game lunch trip. The Truck Yard was well worth a visit too, featuring a beer garden, trailer bar, food trucks, live music, and a treehouse with seating and counters. Throw in dog friendly and pretty kid friendly, and it was tough to beat on an 80 degree day. Physicality and officiating: Officiating was uneven, and in the early pool play games, seemed to dial up a bit of home cooking. While early rounds saw some peculiar decisions, the championship game official was excellent, and very early on made it clear to a harassing fan that abusive language wouldn’t be tolerated. The rest of the game, he was fair, balanced, and far from the center of attention (as it should be). The biggest observation regarding officiating was that they really let the kids play, and in dangerous fashion. With the exception of the final, whistles were frequently silent and rough play went uncalled, leading to increasingly physical play as games progressed, along with agitated parents, fans, and coaches. I was consistently surprised at how much rough play was permitted at this age group. Rules: Part of the physical play was likely due to an odd juxtaposition of the new small-sided format and field size, mixed with (apparently) international standards where there is no offside rule, no build-out line, and heading is allowed. Beyond being a tough adjustment for teams who have logged a lot of games in the last 12 months under the new U.S. soccer rules, it really changed the game flow. Instead of quick distribution from keeper to center backs behind a build out line, punting was prominent. No offside rule rewarded long balls and direct play, and also pinned center backs deeper than normal, at the expense of maintaining good shape and connection to midfielders. Lastly, free kicks were extremely impactful in nearly every game. Anything from midfield in was a consistently strong scoring chance, given the small field dimensions, skill level of the free kick takers, and relative size of the goals. In summary, it really was a week full of great memories. If the opportunity presents itself for your son or daughter to do this kind of trip and tournament, don’t overthink it. I’m glad we did IberCup USA 2017. Scott, this was a fantastic read. Thanks for writing it up! Thanks Adam! Much appreciated. I’m glad I was given the opportunity to do this series.